Click to enlarge the key above. John Vanderlyn was born at Kingston, New York, on October 18, 1775. He studied under renowned portrait artist Gilbert Stuart and became a protegé of Aaron Burr, who in 1796 sent him for five years’ study in Paris—making him the first American painter to study there rather than in England. Returning to the United States in 1801, he painted portraits and landscapes. Two years later he traveled back to Europe and painted in England, Rome, and Paris, where his painting Marius amid the Ruins of Carthage was awarded a gold medal. In 1815 he resumed his work in America, exhibiting panoramas and painting portraits. His subjects were chiefly prominent Americans, including Robert R. Livingston, James Monroe, John C. Calhoun, George Clinton, Andrew Jackson, and Zachary Taylor; his 1834 full-length portrait of George Washington (after Gilbert Stuart) is displayed in the Hall of the House of Representatives in the U.S. Capitol. 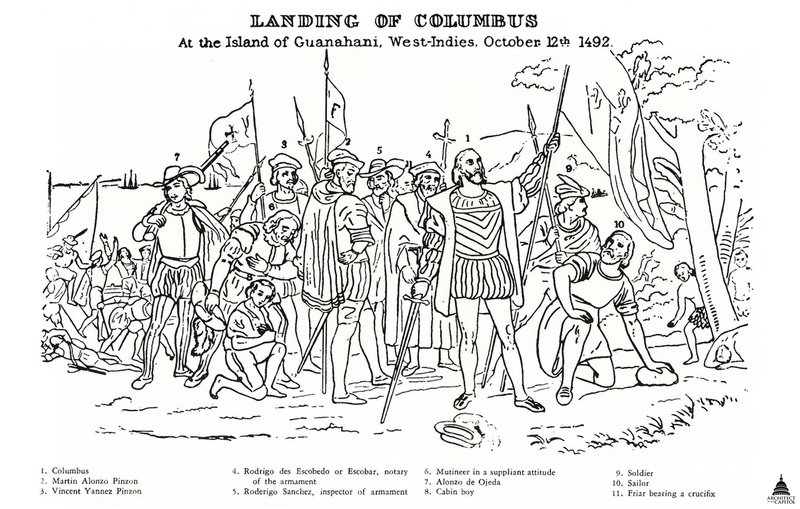 Landing of Columbus would be the last major work of his career, which fell into decline. He died in poverty in Kingston on September 23, 1852.